INTERSPORT Matt, base station Diedamskopfbahn, Halde 300, is the first stop for many skiers before they hit the slopes in the Bregenzerwald. 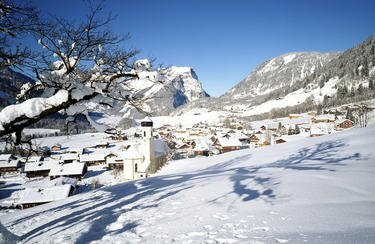 And not without reason: The Ski rental in Schoppernau offers professional full service that ranges from professional ski boot fitting to the storage of equipment in a heated custody. Optimally prepared material is a prerequisite for unlimited winter fun. A principle that the team of INTERSPORT Rent takes to the heart, also for rental equipment. Waxing and grinding with infrared technology provide maintenance and care of skis and snowboards. You have the choice between occasionally fast express or larger full-service offerings. If you rent your equipment at INTERSPORT Matt, base station Diedamskopfbahn, Halde 300, you don´t have to worry about anything: If you require, your rental equipment is always grinded, waxed and polished - at no additional costs. Get FREE information for your holiday in Schoppernau to your mobile! I honestly think this is the best ski rent shop I have ever rented my stuff. My parents and I talked about it when we picked up the materials and when we brought them back. We said to each other that the service is so fast, so friendly and the help and service you get is really, really good. A few examples: when you enter the ski rent someone immediately asks what they can do for you. There was no hassle switching on the last day from snowboard to ski shoes for me and renting extra skies. The electric devices and programs the staff uses are really efficient and together with the fact that the staff self works really efficient ánd at the same time really friendly makes it a great atmosphere. Definitely a place I will recommend to friends and return back to. Thank you! Every year we enjoy our stay in Schoppernau and your very friendly service en excellent rental equipment. See you next year! es war alles gut, nach 10jähriger Pause wieder auf der Piste, SUPER !!! !